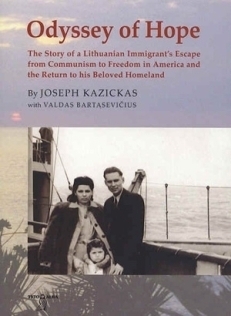 Published both in Lithuanian (Vilties Kelias) and English, Odyssey Of Hope is the life story of Joseph Kazickas who found freedom and success in America after a dramatic escape from his country during World War II but never lost his longing and devotion for his beloved homeland. The Kazickas "journey"- finding courage in the face of danger and home in the world of exile - spans most of the 20th century. It traverses the globe and covers the history of Lithuania from independence in 1918 through the Nazi invasion and 50 years of Soviet occupation. When finally independence was regained in 1991 after the many years Kazickas and so many worked to keep the dream alive, he embarked upon a mission to help bring economic prosperity to democratic Lithuania. While his voice powers the stories in the book - life as refugees, immigrants, freedom activists - it is his wife Alexandra's candid expression through her diary entries that gives this dramatic saga some of its most intense and personal recollections. To learn more about the book, to read exerpts and to purchase it, please go to Odyssey of Hope website.